Who were the winners at UFC 214: Cormier vs Jones 2? Click below to get the results for all the fights at Honda Center in Anaheim, California on Saturday, Jul 29, 2017. 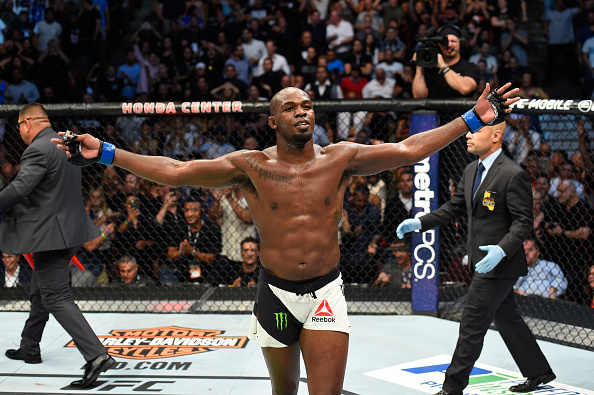 After arguably losing the first two rounds, Jon Jones settled in and landed a headkick right on the money. Daniel Cormier was rocked and Jones pushed forward and erupted with the finishing sequence of ground and pound to win back his light heavyweight title by TKO at 3:01 of the third round. Jones out-struck Cormier 94-57 in significant strikes and neither fighter landed a takedown. Jones extends his overall win streak to 14 in a row, now just two wins from tying Anderson Silva’s all-time mark. 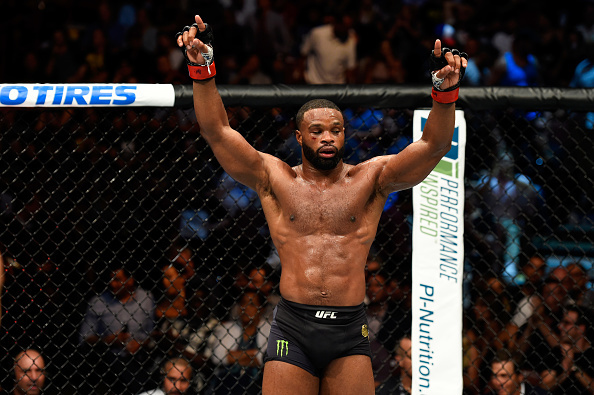 Tyron Woodley stopped all 24 of Demian Maia’s takedowns and won in a landslide unanimous decision (50-45, 49-46, 49-46). Woodley out-struck Maia 45-23 in what was generally not appreciated by fans in attendance. Woodley said after the fight that he fought a specific gameplan because when Maia gets your back he’s the most dangerous. Woodley defends his title for the third time. Cris Cyborg finally wears UFC gold around here waist after taking out tough Tonya Evinger by TKO at 1:56 of the third round. Cyborg controlled the entirety of the fight but Evinger had her moments, evading strikes and looking to clinch. 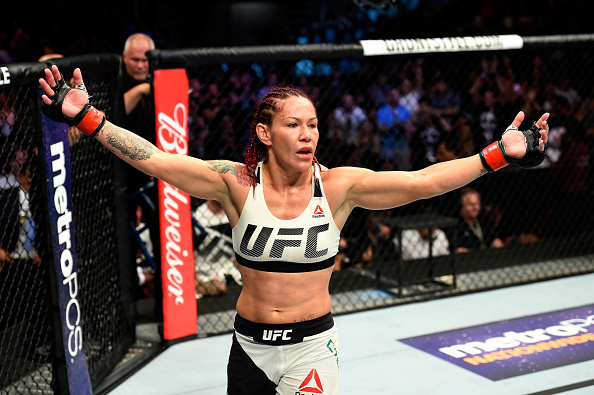 She even landed a takedown in the first round but Cyborg stood right up. 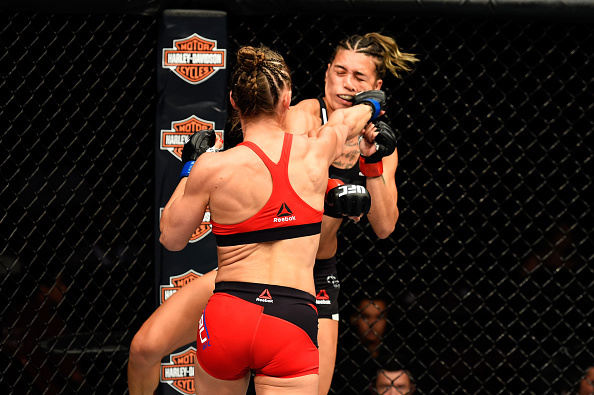 In the end the significant strikes began to add up for Cyborg, who finished landing 83 sign. strikes to just 23 for Evinger. 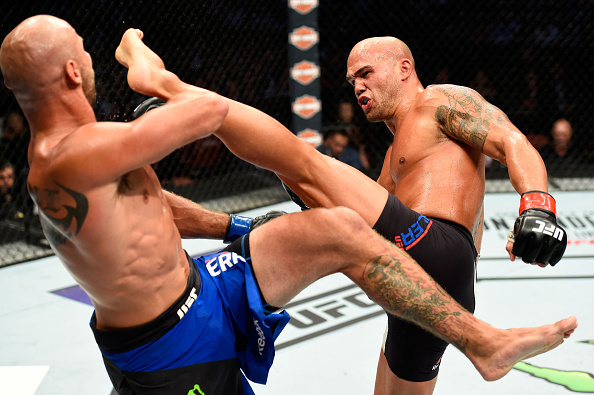 In a fight that lived up to its massive expectations, Robbie Lawler edged Cowboy Cerrone in a unanimous decision (29-28, 29-28, 29-28) in a fight that left everyone in the arena wanting more. Cowboy landed just 1/13 takedowns but landed more total strikes, 83-72 and had the edge in significant strikes landed, 72-64. Lawler came out on fire in the first round, pushing Cerrone back and landing bi shots that rocked Cowboy a bit on two occasions. But Cerrone owned the second round, landing a few head kicks and firing off combos. The two combined for almost 60 significant strikes in the final round before heading to the judges. 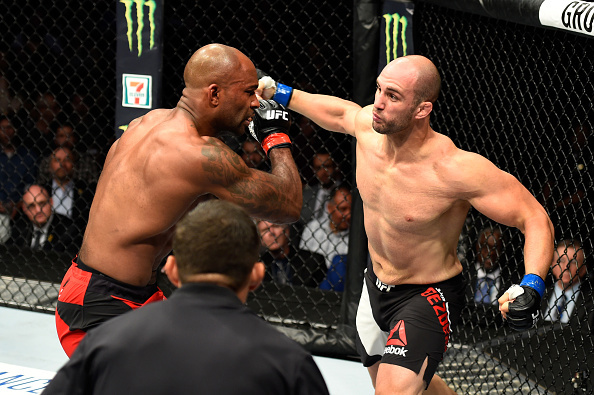 Volkan Oezdemir continues his shocking rise in the light heavyweight division with a first-round TKO win against Jimi Manuwa in just :22 of the first round. Manuwa looked to clinch with Oezdemir, who responded with a few big left hands that rocked Manuwa. As “Poster Buy” retreated, Oezdemir charged forward and caught Manuwa, who went tumbling to the mat before the finish moments later. Oezdemir now moves to 3-0 in the UFC. 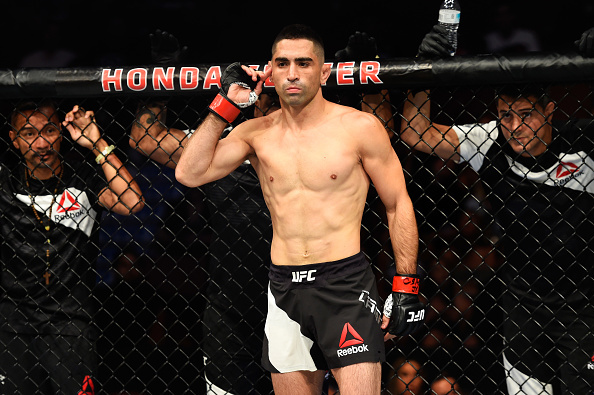 Ricardo Lamas steamrolled through prospect Jason Knight with a flurry of big winging punches before finishing him at 4:34 of the first round by TKO. It seemed like Knight, who is very confident off his back, thought he could eat punches long enough or until he dropped, where he would be able to survive because of his grappling. But Lamas kept unloading with big shots and when Knight finally fell the referee was forced to jump in and stop the fight. 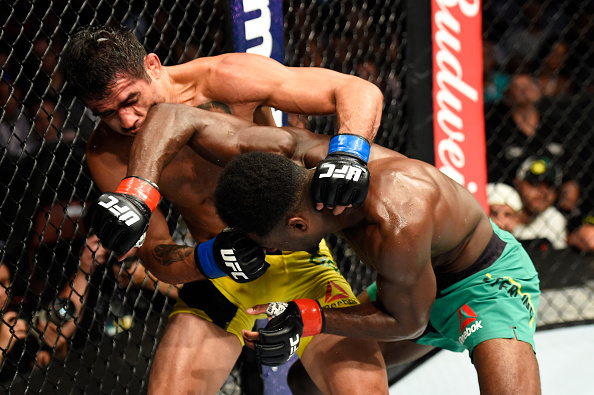 Aljamain Sterling showcased some improved striking and elite-level ground game to take the unanimous decision win (29-28, 29-27, 30-26) over former bantamweight champion Renan Barao in a catchweight 140-pound bout. Sterling was aggressive with the ground and pound when he got top position, controlling the former champ for 5:37 and out-striking him 112-65. 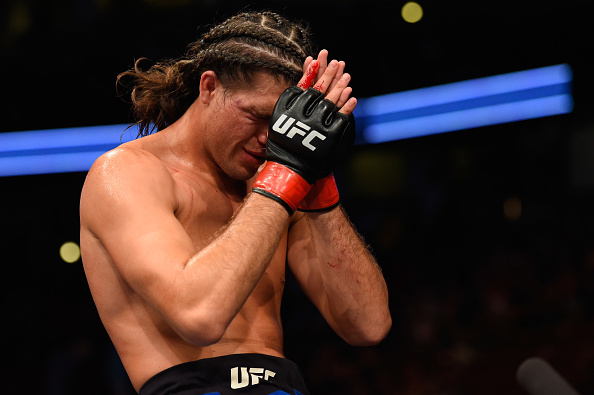 Brian Ortega handed Renato Moicano his professional loss when “T-City” sank in a guillotine choke at 2:59 of the third round to secure the submission win after a firefight on the feet for almost three full rounds. The win gives Ortega four wins now in the UFC as he improves to 12-0 in his MMA career. 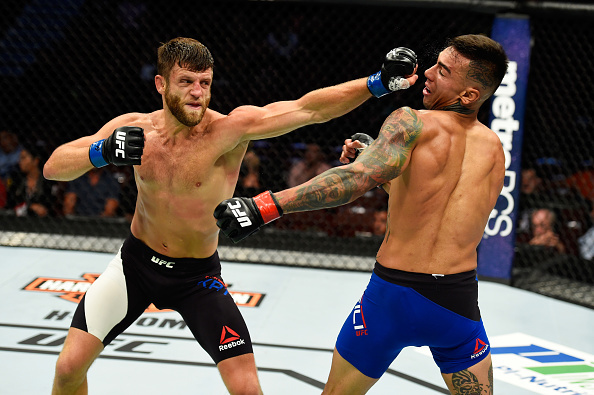 Calvin Kattar picked up the unanimous decision win (30-27, 30-27, 30-27) on short notice filling in for injured DooHo Choi to take out Team Alpha Male’s Andre Fili. Kattar landed the only takedown of the fight, but was outstruck by Fili, 74-73 in a super close fight despite how the scorecards read. Alexandra Albu showed her toughness and exciting fighting style in a hard-fought victory over Kailin Curran by unanimous decision, 29-28, 29-28, 29-28. In the first round Albu was winning the standing exchanges and then oddly pulled guard after a nice combo. But she quickly swept Curranand spent some of the round in top position. After a head and arm throw, Albu was landing huge shots but Curran was able to pull off a sweep of her own for what was a super entertaining first round. 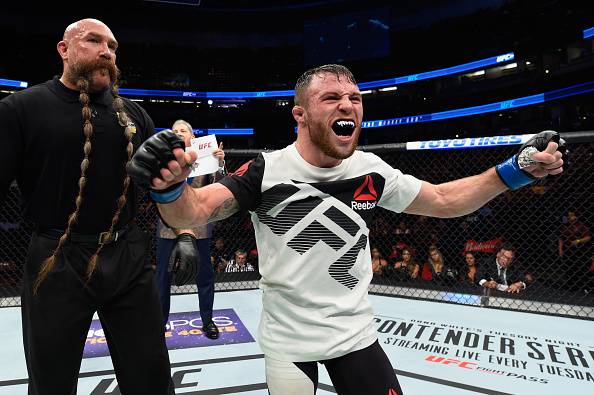 In the end Albu was bruised up on the feet, as Curran landed more total strikes (141-132), but it was Albu who had the most significant strikes (96-73) and five takedowns in the fight. Albu improves to 2-0 in the UFC. Jarred Brooks landed five of nine takedowns and looked to have a guillotine choke in tight in the first round before time ran out. He picked up the split decision win over Eric Shelton (29-28, 28-29, 29-28). Brooks wasn’t thrilled with his performance he told Joe Rogan after the fight, but he picks up the win all the same in his UFC debut. Drew Dober landed an overhand left on the chin of Josh Burkman, sending the veteran to the mat to pick up the first win of the night by KO at 3:04 of the first round. 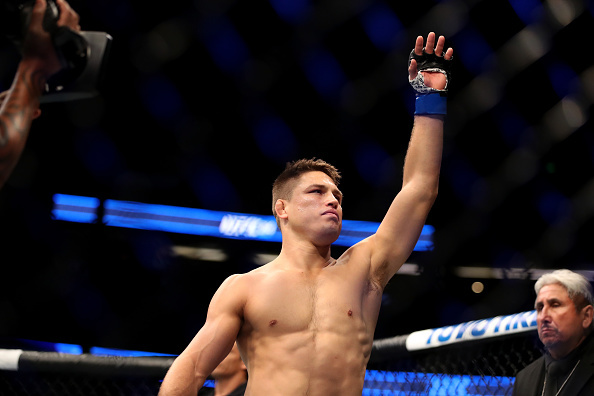 The two were just getting comfortable when the younger Dober showed off his hands with a great KO to kick off the night for his third win in his last four.